Here you will find a wide selection of extension cables from Brennenstuhl, Feirol, AS-Shwabe, Rubi and others manufacturers. Use special filters to find the extension cable you need quickly and conveniently. For your convenience, we have grouped all extension cables according to manufacturer, length, purpose, maximum permissible load, type of plugs and sockets, type of drum and other important parameters. Outer shell material - when choosing an extension cable it is very important to evaluate its outer shell material. The material depends on the use of the cable (its resistance to extreme temperatures (cold and heat), friction, bending, etc.). Usually plastic, rubber, polyurethane, neoprene, textile or glass fiber are used for the outer cable shell. Recommended use - extension cables can be used only indoors, indoors and temporary outdoors, outdoors. The purpose of the cable is defined by its environmental protection class (IP) and the outer shell material. Reel type - many cables have a reel that can be used to wrap a cable and increase the convenience of using an extension cable. 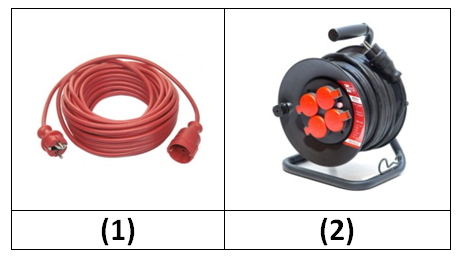 Extension cables can be without reel (1), with a plastic reel (2), with a steel reel or with a light alloy reel. For electric garden tools, the most commonly used extension cables have no reel and only one socket (3), because only this type of cable can be used for comfortable work in your garden (electric garden tools usually have a very short power supply cable with a plug at the end). It is very important to use extension cable with the garden tool, which is for outdoor use. 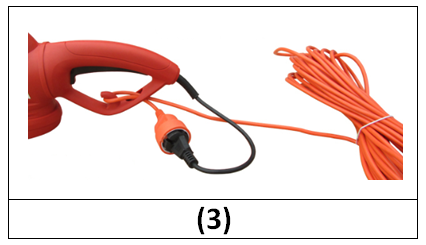 Number of wires - for the power tool it is enough to have 2 electric cable strands (phase and zero), but recently the extension cables with grounding have already become a standard, so the vast majority of cables have 3 wires (phase (a), zero (b) and grounding (c)). Grounding wire increases safety working with power tool and protects user from electric shock in the event of a current leak. However, this protection will only function if the extension cable with grounding is connected to the mains socket with grounding. Wire Diameter - wire diameter of extension cable defines the maximum allowable cable load in watts (W). The higher cross-sectional area of wire, the higher is power of electrical device, which can be connected to the extension cable. The analogy with plumbing tube can be used to explain the importance of wire diameter and the way it works - the larger diameter of pipe, the bigger water amount can pass through a fixed time interval. Maximum load unreeled / fully extended - the maximum permissible cable load varies depending on whether the cable is twisted on the reel or it is completely unreeled. A fully unreeled extension cable can withstand a higher load in watts (W) than the same cable, just twisted on the reel. This is because the rolled-up extension cable is similar to a coil. Strong electric current in the cable creates an electromagnetic field, which causes the cable to heat up and it is dangerous. Socket/plug type - extension cables can be used for single-phase (1), single and three-phase (3) and three-phase (2) devices/tools. Single-phase power supply network parameters are 220 - 230 V/50 Hz. Three-phase power supply network parameters are 400 V/3x50 Hz. Three-phase units usually have more power and use electricity more efficiently. The shape of plug and socket is different, depending on the type of extension cable (single or three-phase item).